What is the Cube of Karma? So Tom, I’ve been hearing some glowing reports about the Cube but what in the world is it? Thanks Rachel, in short it’s a one-to-one mentoring programme to take people on an elegant path of accelerated evolution. That sounds fantastic but you can’t just say that and leave it there, where did it come from? Did you just make it up or channel it? It’s based on some esoteric knowledge called the Cube of Space which I came across a few years ago and didn’t know what to do with. When I wrote my book Flavours of Thought last year, which is inspired by the Major Arcana, I realised I could map my Flavours on to the Cube. Then, in an amazing light bulb moment, I realised that I’d simplified what was a bit arcane and obscure and made it accessible to a contemporary audience. It starts with a bit of pre-work where we establish a person’s karmic purpose. This includes listening to a guided visualisation and completing a simple questionnaire. I also tune into the person’s etheric body which tells me about residual karmic issues that may need voiding. It’s kind of the opposite of avoiding. We often procrastinate and become busy fools and a-void what we came to do. By voiding issues and tackling them, you both cleanse your aura and fulfill your pre-agreed karmic destiny. Are you saying that our life is pre-agreed and pre-determined? Yes and no – this is one of the great mysteries that results from us being inside our so-called 3D reality. Our life is BOTH predetermined AND we have complete free will to change it at any time. This apparent paradox only becomes clear when we can see ourselves from outside the illusion. So when people embark on a trip around the Cube, does this become any clearer? Yes, the key to understanding this paradox and to jumping up an evolutionary step is to see our lives as a series of ‘things that arrive’ as opposed to events we instigate. 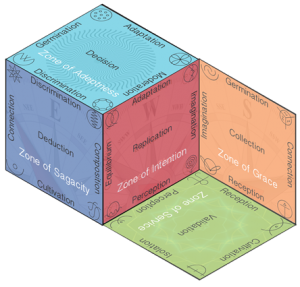 When you start journeying around the Cube, you get amazing objectivity and clarity about this. Everything starts to make sense and really wonderful serendipities come your way, as if by magic. And how long does a trip around the Cube take? Well there are six faces to the Cube and some hidden internal pathways. The number of sessions depends a lot on how far someone has already come but typically we’d be looking at between 3 and 6 sessions ranging from 1 to 2 hours each. I recommend these sessions are spread over a few months too. And how do people get embark on a journey? Well the first step is to have a listen to the visualisation I mentioned which takes people on a trip the Akashic Records Office where we make our life plan for each incarnation. It’s only 11 minutes long and people get some amazing insights from it.